The Drake, well-known for its excellent tanking abilities, is a very popular PvE ship. In PvE, the Drake can be passively shield-tanked for a stronger tank than a battleship, making L3 missions easy and L4 missions a possibility. However, without very good missile skills L4's will take a long time. 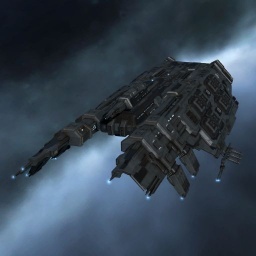 While the Drake was long ago common in PvP fleets, a nerf by CCP has made the Drake unpopular in PvP. It can be fitted with a durable shield buffer tank, but it receives a damage bonus only for kinetic missiles, reducing its flexibility. With Heavy Missile Launchers the DPS of a Drake is not very impressive for a battlecruiser, but it has a long range for its class. The Drake is quite easy to skill for and pilot competently. Its tank bonus makes it forgiving of mistakes, and missiles are an easy to use weapon system that doesn't require the pilot to worry much about angular velocity and range. While it's easy to make it a good L3 mission boat, it's hard to make it fantastic: it is quite slow, without T2 launchers and ammo it only does okay DPS, and clever piloting can't be used to increase missile damage like it can with turrets. While you can start missioning with this skill at III, skilling to at least IV will provide a foundation of decent tank and decent DPS. 5% bonus to heavy missile damage per skill level. Heavy Missiles, due to their long range, are often used in Level 3 mission fits. Train to IV to maximise your time/benefit ratio. 5% bonus to heavy assault missile damage per skill level. Drakes are used in Factional Warfare PvP, often fit with Heavy Assault Missiles. Heavy Assault Missiles have a shorter range than Heavy Missiles. 2% Bonus to missile launcher rate of fire per skill level. This skill is required to operate any rocket or missile launcher. Training it also increases your rate of fire, which means more damage dealt per second. 3% bonus to missile launcher rate of fire per level. Rapid Launch increases your rate of fire, increasing damage dealt per second. 2% bonus to all missile damage per skill level. Simply deals a direct increase to damage dealt. 10% bonus to all missiles' maximum velocity per level. While this skill decreases the time it takes for missiles to actually deal their damage, it also increases their range. A missile that travels faster is a missile that travels further. 10% decrease per level in factor of target's velocity for all missiles. Even though this skill doesn't increase on-paper DPS, it does increase your actual in-game damage application. As a target's speed becomes less of a factor, more damage is applied. This is especially helpful against smaller, faster ships. If you're more familiar with turrets, this is analagous to better tracking speed. 10% bonus to all missiles' maximum flight time per level. Like Missile Projection, this skill increases range, just in a different way. Instead of making your missiles faster, it makes them fly longer. 5% reduction per skill level in the CPU needs of weapon turrets, launchers and smartbombs. Helps with fitting a ship by decreasing the (often large) CPU requirements of weapons. Engineering skills as needed to fit your ship properly. 5% reduction in shield recharge time per skill level. This basic shield skill allows you to fit shields but also helps with passive buffer tanks that rely on shield regeneration to tank incoming DPS. 5% bonus to shield capacity per skill level. This skill gives a bonus to shield capacity. Larger shield capacity allows for more shield regeneration, again helping passive buffer tanks. Reduces the chance of damage penetrating the shield when it falls below 25% by 5% per skill level, with 0% chance at level 5. IMPORTANT: This skill is part of the T2 Shield Tank skill set. This skill reduces the change of damage "leakage" between shields and armor. Training it to IV allows for the use of T2 active shield hardeners, one of the building blocks of a good T2 shield tank. 5% reduction in shield upgrade powergrid needs. Improves the effectiveness of passive shield hardeners. Can operate 1 drone per skill level. Train Drones to V to operate 5 drones. It's important to have a full set of Drones to maximize the effectiveness of your Drake, especially against smaller targets that your Heavy Missiles might have a harder time killing. The Drake only has enough drone bandwidth and dronebay to support 5 light drones, but skilling up those 5 drones can help increase your effectiveness greatly. 5% Bonus to damage of light drones per level. Increase the effectiveness of your drones by making their pew pew more powerful. Drone control range increased by 5,000 meters per skill level. Useful if you want to attack things that are far away. 5% increase in drone MicroWarpdrive speed per level. Helps your drones get to their targets faster. 5% bonus to drone shield, armor and hull hit points per level. Drones are pretty fragile. This skill will make them a little less fragile, but only a little less. This skill is important for sentry drones (due to their immobility) in particular, but can provide a little boost for combat drones as well, despite combat drones having MWDs. This train may not be worth it if you're just leveling up to Level 4 missions. However if you've got a Tengu in your future, or if you're grinding Level 3 missions for standings, you'll want to train this sooner rather than later. 5% decrease per level in factor of signature radius for all missile explosions. Like Target Navigation Prediction, this skill helps take the edge off smaller targets. This is in the advanced skill category as it requires Missile Launcher Operation V as a prerequisite. Reduces CPU and Powergrid requirements, respectively, for weapons. If you're going to try to fit T2 launchers on a Drake, you're probably going to want this. These skills will also make fitting many other ships much easier. Allows T2 Gallente light drones. Substitute any other racial variant in for the Drone Specialization skill. If you want to squeeze the most DPS out of the Drake's tiny drone bay, T2 drones are the way to go. They're expensive but worth it. They're superior to T1 drones in almost every way. Allows for the use of the Damage Control II module. Although many Drake fits do not use a DCII module, it can be useful in some cases. This list of skills may seem daunting at first, but you don't need all them to start doing things! Make it up as you go -- start doing what you want to do and figure out where you need to go from there. You may start with weak shield and weak missile DPS, but you can have fun right away. Remember as well that all of these skills are useful for fitting other ships. You're not going to somehow outgrow these skills, even if you outgrow your Drake. Universal for all sorts of PvE, including WH C2 combat sites. Select you tank modules to counter specific rats damage. If no much tank needed Replace Shield Power Relay by Ballistic Control System to increase DPS. Replace Ballistic Control System by Capacitor Flux Coil if face neut pressure (may happen at some sites in WH). Use Meta modules instead of T2 if lacking skills. After nerfs, Drake is not as good as it was. If the mission is unfamiliar to you, read about it on EVE-Survival. Because the Drake is almost always passively tanked, you have no tools apart from running to mitigate excessive damage. If your shield drops to 50%, align to a celestial and start your afterburner. If it drops to the 25% alarm, warp out, dock, and then come back for more later. When you do come back, warp in at a long range (like 50 or 100km). Remember that the Drake is big and slow. You won't be able to sig tank or speed tank incoming damage. Range can be one the most effective ways of mitigating incoming DPS while piloting a Drake. Shoot the biggest NPCs first (usually other Battlecruisers); they're the ones damaging you the most. Against Sansha and Blood Raiders, use Mjolnir Heavy Missiles unless you have Caldari Battlecruiser V. In all other cases, use Scourge Heavy Missiles. Orbiting the NPC blob at 30km works reasonably well. This page was last modified on 3 July 2017, at 21:54. This page has been accessed 532,286 times.